The economy and stock market are heavily influenced by seasonal factors. For example, a strong holiday buying season tends to be bullish for retail stocks or rising energy costs hurt airline profitability. Awareness of seasonal trends in both the economy and stock market can put you in a better position to profit from sectors and stocks that are likely to outperform the overall market. And technical tools can then be used to confirm emerging trends and time entries into these stocks and sectors. 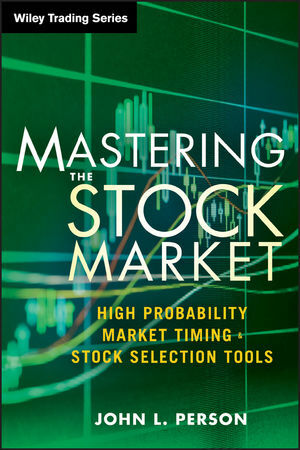 Mastering the Stock Market provides authoritative insights into a method for trading stocks based on seasonal trends, sector analysis, and market timing. Taking a top-down approach, the book explains how seasonal supply/demand forces impact commodities and different sectors of the stock market. After learning how to identify stock market sectors and commodity ETFs that are ripe for a big move, you'll quickly discover how to use technical analysis to gauge the strength of the sector or commodity and then identify the strongest stocks and ETFs to trade. Along the way, you'll also learn how to use the author's own indicators, Persons Pivots, to identify support/resistance areas and pinpoint optimal entry and exit points. To successfully trade today's markets you need to use a proven approach and have the discipline to effectively implement it. Mastering the Stock Market has what you need to achieve these goals and capture consistent profits along the way. JOHN L. PERSON is a thirty-two-year veteran of the trading industry, having worked as a floor trader, broker, analyst, and founder of NationalFutures.com, an online education site. He developed the Person Pivots (PPS) and other technical indicators that are on several companies' popular trading platforms, including TD Ameritrade, TradeStation, Open E Cry, NinjaTrader, Tradesignal, and Trade Navigator. Person has taught thousands of traders including members of the largest exchanges, and frequently speaks at industry conferences. He is the author of three nationally and internationally popular trading books as well as three trading courses and a DVD seminar series. Person's latest book, Commodity Trader's Almanac, is the authoritative guide to trading the seasonal aspects of the commodity markets and the correlated ETFs and stocks of those markets.